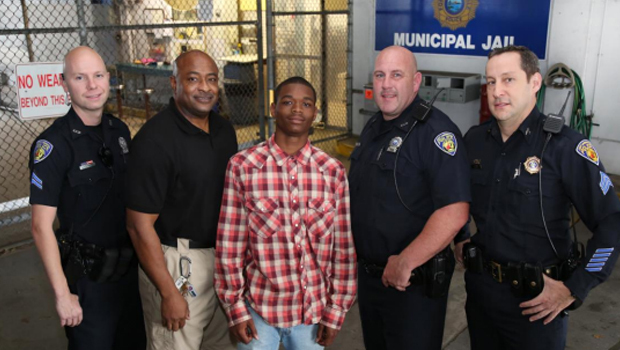 FORT LAUDERDALE, Fla. - Police in Florida are honoring a teenager whose quick thinking is being credited with helping to save the life of the officer who arrested him. While Officer Franklin Foulks was booking Jamal Rutledge, 17, last September, Foulks suddenly collapsed and Rutledge began kicking the security fence and yelled to alert others to what had happened. Surveillance footage caught it all on tape. Officers passing by heard the noise and responded, administering CPR and using a defibrillator to electronically stimulate the officer's heart. In a statement, Fort Lauderdale police say medical staff later said that Rutledge's actions and the officers' quick response were largely responsible for Officer Foulks surviving the incident. The teen and the three Fort Lauderdale police officers will be commended at a ceremony next Wednesday. According to the Fort Lauderdale police department, Rutledge was being booked on a violation of juvenile probation.